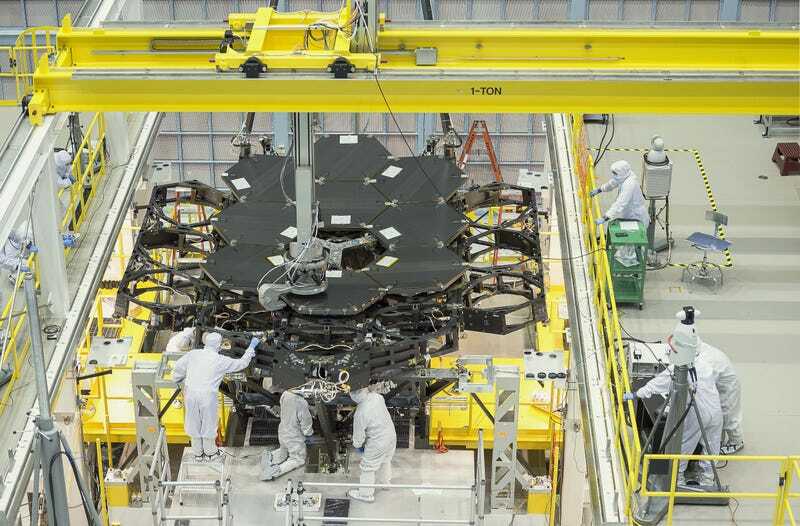 What better way to spend the holidays than watching NASA technicians scurry around assembling mirror segments on the James Webb Space Telescope? With the 9th of 18 segments installed last week, we’re that much closer to hunting for signs of life on alien worlds and making our universe a little less lonely. Telescope construction is no easy business. We’ve followed along as parts were shipped across the country, the support structure was tested, its sunshields were assembled, and its first mirror hung. Now we’re pleased to celebrate that as of December 22nd, fully nine of the eighteen primary mirror segments are polished to perfection and nestled snugly in place. The hexagonal mirror segments are 4 feet, 3 inches (1.3 meters) in diameter, and fit together to form a single 21 foot, 4 inch (6.5 mirror) primary mirror for the telescope. The unique construction allows the telescope to tuck into a smaller volume for launch then unfold in mechanical origami once in space. It also allow for a much larger primary mirror: when completed, the James Webb Space Telescope will dwarf Hubble with its capacity to gather light. You can watch construction from home by peeking in on the cleanroom webcam. The team is currently on break, but mirror assembly will continue in the new year. The telescope is currently scheduled to launch in 2018.